Keep your beverages fresh with the 2 Quart Round Pitcher. It features an innovative pivot-top spout that opens easily with the push of a finger. A comfort-grip handle aids in controlled and natural pouring, while graduated measure marks make it easy to mix drinks right in the pitcher. Its snap tight lid makes for a secure seal, keeping drinks fresh and ready to serve. 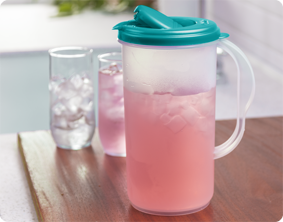 This pitcher is easy to clean and is freezer and dishwasher safe, as well as BPA-free and phthalate-free to ensure that your stored drinks are fresh, safe and healthy for you and your guests to enjoy. The overall dimensions of this item are 7 1/4" L x 5 1/4" W x 9 5/8" H.
Overall Assembled Size: 7 1/4" x 5 1/4" x 9 5/8"
2 Quart Round Pitcher is rated 4.9 out of 5 by 9. Rated 5 out of 5 by Bettyhop from Perfect size! I've got the 1 gallon too and both are used every day in my home. They seal well and keep my beverages fresh. I have had the gallon size for years and when i found this 2 quart I was thrilled! Thanks! Rated 4 out of 5 by DaniCorrelle from Durable, Have Had for Years I have used this product for MANY years and it still looks brand new. The lid is a tight fit and sometimes my children have difficulties in putting the lid on and also pushing the green tab in to be able to pour. The tightness is also a good though because it prevents some accidental spills and ensures the contents stay as fresh as possible. Rated 5 out of 5 by iisanumber from Easy to use and clean I've had this pitcher for several years and two things stand out: 1. It's easy to open the spout with the same hand that is holding the pitcher, making it easy to pour on the go while your cup is in your opposite hand and 2. It's easy to clean since the lid easily comes apart and pops back together. A kitchen must-have. Rated 5 out of 5 by Mrs. S from Great product This product serves many uses. Currently we have been using it a lot lately by the pool to hold our favorite frozen drinks! Very durable and pours without making a mess. Rated 5 out of 5 by Jje1228 from Great product! Great for hot and cold beverages. We use this container for iced coffee and iced tea. Rated 5 out of 5 by 49plus5 from Love it!! Have had it for years... Love it, I have had my little 2 quart pitcher for over 5 years if not more. It is very durable, easy to keep clean and just the right size for the fridge. I use mine for ice tea and I love the lid with the push open lid. Rated 5 out of 5 by Donna Snyder from Perfect for elementary school age kids Awesome, for lunchroom use, kids can pick up full pitcher and lid is pour friendly! 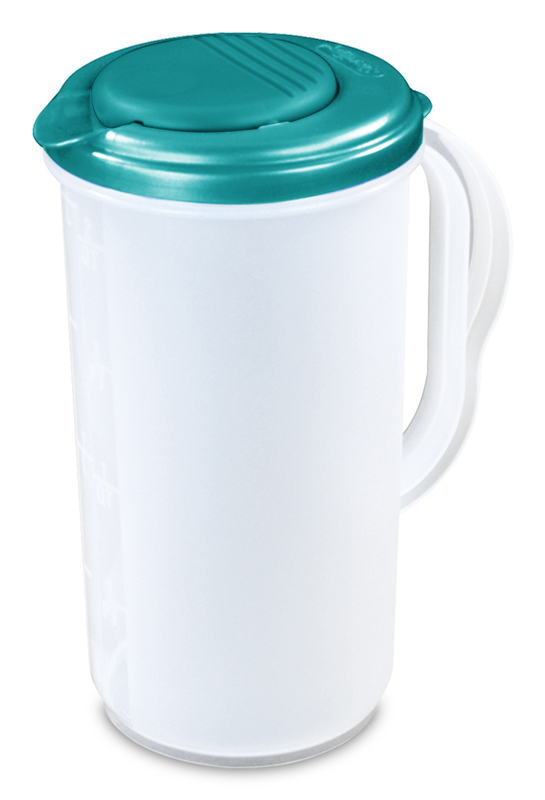 Rated 5 out of 5 by meekrats from Very good I love Sterilite products and this pitcher is good in most ways. 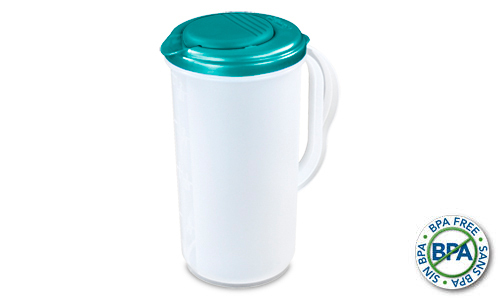 It's very sturdy, it's a safe plastic and the pouring is fantastic, no drops or spilling. One thing that I would wish for is a more rounded handle. The sharper handle is a bit uncomfortable for me to use although my husband has no problem. Other than that, it is very good & I do recommend it, with just that slight caution.